Fresh from its official arrival just last weekend in stores nationwide, the ZenFone Live L1 was definitely a crowd favorite during the Mobile Fest event. With the ZenFone Live L1 as one of the newest phones out in the market, as well as the mystery that surrounded it since it was first unveiled last May 2018, the latest ZenFone undoubtedly roused curiosity among the people on how it could offer more than its well-loved predecessor, the ZenFone Live. 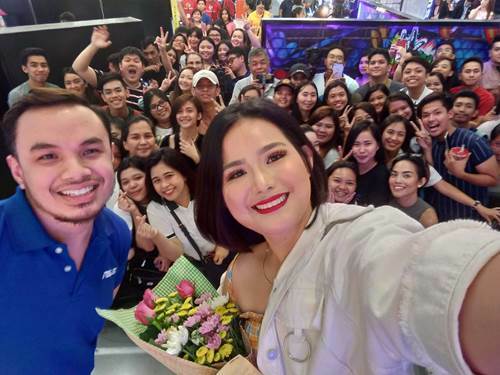 To further excite the crowd, ASUS Philippines partnered with vlogger and YouTube sensation, Shekainah “Shek” Chen – better known for her lifestyle channel, Shek’s Diary. Popular for her content on her daily activities, Shek gave her own tips and tricks to becoming a vlogger and also shared her thoughts on what morecan the ZenFone Live L1 offer not only as an amazing smartphone but also as an aspiring content creator’s best friend. More screen. More energy. More fun. – That is what ZenFone Live lives for and what it promises ZenFans in its return to the Philippines, through the ZenFone Live L1. This time around, the latest variant is packed with everything users loved about the original ZenFone Live but tripled with a whole lot more awesome and exciting features in just a 5-inch body! The ZenFone Live L1’s 18:9 5.5-inch HD+ display is made to show images on screen as vivid as possible. Combining its display with a 13MP sharp shooting rear camera, photos will undoubtedly be breathtaking. The ZenFone Live L1 also comes with a fast face unlock as well as a triple-tray slot, allowing for added security and memory of up to 2TB. Best of all, the 2018 ZenFone Live L1 has a 3,000 mAh battery capacitythat can keep going for hours and hours. The ZenFone Live L1 is available nationwide for the very affordable price PHP 5,995.00! For more information on any of the ZenFone series and other incredible ASUS products, tune in to the ASUS Philippines Facebook Page and the ZenTalk Philippines Forum. ASUS is one of Fortune magazine’s World’s Most Admired Companies, and is dedicated to creating products for today and tomorrow’s smart life. Our comprehensive portfolio includes Zenbo, ZenFone, ZenBook and a range of IT devices and components, along with AR, VR and IoT. ASUS employs more than 16,000 people worldwide and over 5,500 world-class R&D talents. Driven by innovation and committed to quality, the company won 4,511 awards and earned approximately US$13 billion of revenue in 2017.